Rio will be coming to Blu-Ray and DVD on August 2nd!! 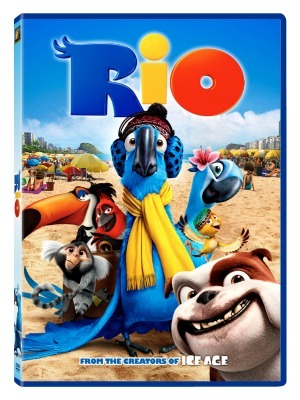 To help celebrate the release, I will be giving a Rio DVD away to one of my amazing readers. I was sent a copy for review as well! This movie is great and the whole family is sure to love it. From the great music and dancing to the bright vibrant colors and detail, this movie is a must have! My kids and myself, loved all of the great music, in fact the music and the musical numbers in this movie are ones that you cant help but dance to. Blu and all of the friends he make are great. Blu is a bird that has to overcome obstacles and insecurities and in the process, he finds himself along the way. He realizes how strong he is and that he is capable of doing more than he gave himself credit for! So keep an eye out Rio to hit the shelves on August 2nd and get your copy!!! Like I had said, I will be giving one of my readers Rio on DVD!!! If you could be any tropical bird, what would it be? Please leave me your email with this entry!! This giveaway is open to US residents. This giveaway will end at 11:59 pm on August 4,2011. Winner will be chosen at random.org and will be given 48 hours before another winner will be chosen. All products for reviews and giveaways are given as a sample from the companies. All opinions in reviews I conduct are my own. I was not paid to say anything or review any products. Next Post Finish Quantum #Giveaway Closed! I already follow you on Twitter. @longwait4bella is my username. omegadoom1 gmail comI would be a green parrot. Thanks Katie! I would be a Macaw. A double yellow headed amazon. I'm a GFC follower.My email is in my profile. I entered the Finish Quantum giveaway.